March 26, 2015: Gwen Stacy comes to the Baxter Building one evening to try to get help from biochemist Dr. Sue Storm. The Baxter Building, home of the Fantastic Four. A twenty-one story skyscraper in the 'concrete gothic minimalist' style, it's notable for the floating circle-four hologram that hovers over it at various times. Like all Manhattan skyscrapers, it has the usual "public space" at the street level. 20th Floor - the "penthouse" apartment occupied by the Fantastic Four. Along with the private room suites for each of the Four, there are guest rooms, a kitchen, a living-room area, a dining nook, and a surprisingly small office/library. There is also a door leading to one of several laboratories. It was late in the evening and presumably there was not a great deal of traffic at the Baxter Building at this time of night; so it would be hard to miss Gwen trying to buzz into the building to see the Johnny or Sue Storm. Gwen looked down at her hands and shuddered a little as she remembered her 'dream' and said to security guard at the door with a bit of annoyance in her tone, "Please, if you could just contact one of the Storms for me, I went to school with Johnny. I'm NOT some fangirl." While she waited for the guard to do something or the Storms to let her in, she stared into a window looking at her reflection. Sue is just finishing up in the lab, brushing her hand over the keypad outside as she steps into the hall. "Johnny!" she calls down the hall. "Security says there's a girl here for you. Is this one serious? You don't usually bring them back." It's at least half teasing. That's what siblings are for, right? The security guard mutters into a handset and a camera focuses on Gwen. The supercomputer that is the real HERBIE spends an entire 100 milliseconds finding the images of Gwen Stacy from the yearbook from Johnny's records, and sends a remote to tell him. He's already prepped for early bedtime, in pajama bottoms and a tee-shirt and making popcorn. "Uh, yeah send her up!" Of course, Sue caught it before he even got told about it. She's fast. "It's a friend from high school. Well, someone I knew then anyway. Could you let her in while I put on people-visiting clothes?" Johnny puts down the pan of jiffy-pop(tm) — yes, he was popping it himself, of course — and dashes into his room, to emerge probably just as Gwen comes out of the elevator. Gwen steps out of the elevator, just as Johnny is emerging dressed decently and she smiles nervously, "Hi Johnny, it's been awhile." She hadn't spoken to him since High School and while the two seemed to have a lot of mutual friends, they had never really hung out since. Of course, Johnny becoming a publicized hero and a member of the Fantastic Four had something to do with her never keeping in contact and was also the reason she was here now. Between Johnny Storm and Bobby Drake, she wasn't exactly sure what was in the water at their old school. The backpack on Gwen's shoulder is shifted and she looks noticeably pale and just a little disheveled in comparison to her normally well-presented appearance. "Laundry's not finished yet," Sue calls back to Johnny, even as she goes to answer the door. "Hey there," she smiles swiftly to Gwen as she lets the girl in. "Come on in, make yourself at home. Johnny should be out…ah, there he is. Johnny, did you eat dinner?" she asks, starting toward the kitchen. "I was going to heat up some of the stir fry from the place down the street, if you want some." Part of the reason they didn't hang out much after graduation is that Johnny pretty much vanished into the world of auto racing, which kept him in the public eye if you cared for that kind of thing, but also kept him away from where they'd all gone to school. And then a while later, there was the whole 'space gives you superpowers but only if you know the right people' thing. Or that's what it seems like sometimes. Johnny nods to Sue about laundry, having learned the 'unstable molecules plus flame-on means clean clothes whenever' rule. It means he doesn't smell like gym clothes. It also means he smells slightly scorchy, but that's normal for him. He grins, still having that same engaging rakish grin he had in highschool, only it's grown up some. "Or I was making popcorn. I was going to go to bed early so I could get to Akron tomorrow to join the team, but I can still fly there instead of driving, so it's all good. So how you been? You want a soda? You liked the orange Fanta, that still true?" Gwen recognized Sue even if she had never met the older girl especially given the pair of them shared an interest in the field of Biochemistry and Sue Storm was one of the leading experts, "Doctor Storm, you have no idea how amazing it is meet you in person. I'm Gwen Stacy. I went to school with Johnny." When Johnny asks her about the soda, she seems distracted when she passes a mirror but shakes it off, "Orange Fanta is still the best Johnny, that will never change." She sets her backpack down on the ground and forces another smile, "I've been good though, mostly. How about you?" The mostly was definitely why she was here. Sue gives Johnny the 'popcorn isn't dinner' look, but she doesn't actually say it. This time. "Well it's always nice to meet a friend of Johnny's," she replies to Gwen, flashing a smile over her shoulder as she disappears into the kitchen. "I'll be back in a minute," she adds. From the kitchen, there's the sound of fridge and microwave before she sticks her head out again. "Did you want something, Gwen?" "Good, mostly. There've been ups and downs," and he dives into the kitchen for a moment, coming back with the jiffy-pop he'd started earlier, and a can of orange Fanta. While he's gone, all twenty seconds, HERBIE hovers nearby, looking curiously with way-oversized eyes at Gwen. "I ate already, this was gonna be a bedtime snack, and I have to cook it since I started it already," he says loudly enough for Sue to hear. In a more normal voice he says to Gwen, "No, really, there's curry in there that's amazing. If you're hungry at all. Or popcorn, that's good too. So what've you been doing? I mean, you know what I've been doing, probably. I ran into Bobby Drake, too, and I heard Flash Thompson was back in town." "No thank you Doctor Storm." Gwen calls back after she takes the soda from Bobby and takes a long drink of it, "I've been going to ESU, Peter's there too by the way." It was awkward, but somehow she managed to stay friends with him. "I saw Flash and Bobby the other night actually! Bobby is as cool as ever and well, Flash is still a bit of a jerk but he's kind of our jerk." Another sip of her pop is taken, Johnny would definitely notice Gwen was unusually nervous about something. Sue is going to be busy in the kitchen for a few minutes, reheating leftovers and putting dishes into the dishwasher. Which doesn't mean she isn't listening. She's totally listening. Johnny does in fact notice that Gwen is jittery. He caught that nervous glance at the mirror too. He'll play small-talk for a minute or two so she'll relax a bit, but if she came here, especially at a weird hour without phoning to make an appointment, then yeah, something is probably up. Meanwhile he covers up the awkwardness by holding the jiffy-pop pan with his left hand, over the palm of his right hand, sliding it around like his hand was a stove burner. Which, for the moment, it might as well be; the popcorn inside begins making that poippoppiff sound and the foil dome begins to expand upward. "How's he doing … uh, Peter, I meant. But Flash too." The subject of Peter Parker, it would seem makes Gwen a little less nervous and she sets her pop down before sitting down on a couch, making herself at home as Sue told her to, "Peter is great." She blushes, "Like, he's doing great. He should graduate this year, maybe we can all get together and catch up sometime. Without Flash trying to take someone's lunch." She's staring at Johnny making his own popcorn before she asks, "Do your powers, ever give you problems?" "Flash was definitely a growing boy," Johnny laughs. "He didn't take my lunch more than once." Because Johnny did a cruel thing involving a sandwich with added fiber, and an immodium tablet, that brought him to a painful stand-still for a day or two. "They did when they were new. Reed and Sue made some special training programs and biofeedback scanners. You don't feel any heat from my hands even though they're at 375 degrees 2 feet away, because I can control the thermal transfer. I'm pretty sure Bobby … you knew Bobby Drake is Iceman, right? It's like public knowledge with him in the X-Men Red Team. Anyway, I think he could do the same thing with practice." Which is of course when Sue comes out with a bowl of stir fry, quirking a brow at Gwen's question. "We all used to have some trouble with our powers sometimes," she chimes in, pausing before she gets to her usual chair. "Do you two mind if I join you?" she asks. "I can take this somewhere else if you'd prefer," she adds with a small smile. "Yep, I know Bobby's the Iceman." When Sue asks to join them, Gwen looks relieved, "Please. I really wanted to meet you under better circumstances, but I could probably use some help if you can both keep a secret." She picked up the pop and drank it all, she was definitely scared of something. "Usual rules, if it doesn't hurt other people, my lips are zipped," Johnny says. That's exactly what he said in school too, though Gwen may not ever have heard it. He's now wondering if there might have been something strange about that high-school. Bobby and a couple other kids turning out mutants. Himself and Sue (yeah, she was only there briefly but it was long enough apparently.) Gwen is making 'I have newly discovered powers and it's messing me up' noises. At least that's what it seems like. It could be worse, she could have a case of the Grimms, and hate her life. Fortunately Ben has Johnny to keep him focused. Popcorn is done! Johnny puts it on a trivet - yeah, he keeps one of those here on the coffee table for appearances - and pulls open the top of the bag, not caring about hot steam. Ahhh, popcorn. "Secrets are sort of our thing," Sue says with a rueful smile, settling into her chair and starting in on the stir fry as she takes a closer look at Gwen. "Secrets and science. Which tend to run together. What's worrying you, Gwen?" she asks gently. She recognizes those sorts of question just as much as Johnny. Gwen glances towards the door but it was too late to back out now, she could tell her questions and nervousness had probably aroused some suspicion. A loud sigh escapes Gwen's lips and she looks towards the pair, "I was working on a paper on mutation, you know, like Bobby's." She's looking more towards Sue as a fellow Biochemist now as she explains, "I suspected that there might be a missense mutation but it was hard to actually prove anything without any samples. I have a job at STAR Labs and I didn't think it would hurt anyone if I took a mutant spider out of cold storage so I could collect some cells to lyse and analyze the dna. The spider bit me and ran away." "It made me really sick for a few days and then," Gwen sighs again, "Well, it might be easier to show you." Johnny leans back, pulling the popcorn out of the way. "Go ahead," he says around a mouthful of popcorn. Sue's brows rise as Gwen explains, the terms and the implications racing through her mind as she nods along. "The world would be a much less interesting place if everyone followed proper scientific protocols," she murmurs with a small, encouraging smile. "But I'm guessing it didn't end with a stomach bug. What happened next, Gwen?" Gwen stands up from the couch and does a mid-air somersault before landing on the ceiling, looking down at Sue and Johnny. A stream of webbing is shot out from her wrist and she snags the Jiffy Pop and munches on a few pieces, all while upside down. She drops to the ground perfectly, all of her actions would have made any Olympic athlete extremely jealous. "I can do more, but it's not really important. I don't want it. It's a headache and it's just getting worse. I think, it's changing me." She looks at Sue, desperation in her eyes, "I need you to cure me Doctor Storm." 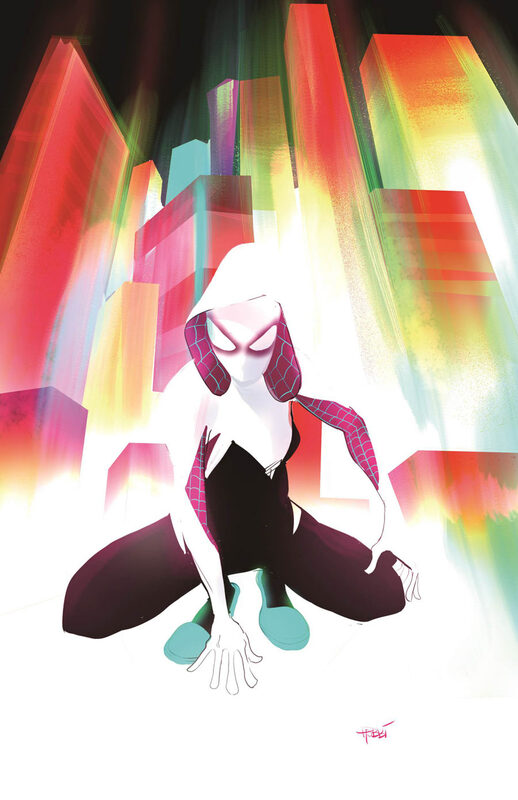 "Holy… Spider-Gwen!" Johnny blurts. "That's awesome!" And then she asks to be cured. Right. Some people don't want powers. Weird. "But yeah, you should totally at least find out what it's doing. So. Spidey got his powers from a spider-bite huh." Because J. Storm Esquire is not completely dim. "That's very impressive," Sue starts as she watches Gwen, setting her stir fry aside to try to get a closer look at how it's being done. Though when she asks for it to be taken away, Sue glances back to Johnny. The Storms are very different people in a lot of ways. But one of the few things they absolutely have in common? Neither of them would give up their powers. "When you say it's a headache, Gwen, do you mean you literally have headaches? Or is it more that you're finding the changes uncomfortable, or difficult to deal with?" she asks. "How is it changing you?" Gwen blinks when Johnny calls her Spider-Gwen. If she wasn't worried about a secret identity, it would have been perfect; instead she was more worried about getting rid of these powers before they became a burden or responsibility. "At first, it was just an actual headache to try and do a little good with my powers and try to live my life. In the past few days though, it's turned into something else." Gwen sits back down on the chairs, shoulders slumped in defeat. "I can't focus, when I sleep, I either have nightmares." She just shakes her head after the mention of the nightmares, they terrified her. "OR I wake up in the strangest places like IN a web and I really want to catch stuff and um, eat it." That last part was hard to admit. If she had eaten anything caught in one of those webs, there was no way on Earth she would be admitting it. "Yeah, someone your size, you'd be catching the morning traffic copter, and those guys are hard enough to swallow," Johnny says, totally deadpan. Note, he may have been working on 'Spider-Jokes' for a different spider-powered person. Because. "I'm just wondering how spider-powers come from spider-venom. That stuff's not genetic retrovirus material, is it?" Sue quirks a brow at Johnny. Little brother's been reading. "I can see where those things would be disturbing," she nods to Gwen. "I can't…promise we can cure you, Gwen. Not without looking at things, seeing how this works. And maybe not even then. But I can promise that if that's what you really want, we'll do our best to fix what we can." As to how spider-venom works to introduce superpowers…She reaches up to rub a hand at the back of her neck, considering. "It's one possibility, Johnny, though obviously the spider would need to have been altered. Maybe meant as a host for the mutagen? Conventional methods of injection would be more practical, unless whatever makes the changes needs a living host." Gwen rolls her eyes at Johnny, "Hahah, very funny." She was more worried about some of the other things she had found in the webs, so far no humans at least! "I honestly have been trying to figure out how a spider bite could do this, I'm guessing that's part of the reason it was in cold storage. The doctor who had been experimenting on it died in the particle accelerator explosion, so it's not like we can just ask him for help." She rolled up her sleeves and looked to Sue, "Do you want to take a blood sample? Maybe you can find a way to isolate the mutations, I don't know. I'm still a student, I tried to do all I could on my own but I'm scared and I didn't know who else to turn to." Well, where she wouldn't end up a science experiment anyways. GUILTY. Sue left a biochem journal in the bathroom the other day and Johnny needed reading material. It's impossible to be around big brains like Reed and Sue and not pick stuff up. Even Ben does it. Though, he and Johnny work at keeping themselves grounded through the art of prank-fu. It distracts the others from their secret agenda to take over the world. "Sure, aiwuahoaw?" Johnny says intelligently in response to Sue. He looks at Gwen and says, "Ve vill be glaaad to take your bludd. Bla bla." Seriously? He can even take blood samples on himself after the first year of their experiences, because they were testing it so often. "This is why I'm so 'uptight' about procedures in the lab," Sue points out to Johnny when Gwen mentions the whole particle accelerator explosion thing. "We already got super powers from science gone wrong, I think if it happens again we're out of freebies." Johnny's vampire impression gets a good-natured roll of her eyes before she looks back to Gwen. "Blood samples are a good place to start, though, yes," she agrees. "And once we've got a baseline from that, then we can get you set up in the scanner and see what we can find." Gwen laughs at the vampire impersonation, looking far less nervous than she had when she entered, "Sorry for springing this on you. I've been missing school and work the past few days, my parents are worried and I didn't know who else to turn to." She looks out the window to the glittering lights of the city and the pigeons perched on the windowsill, "If you like, I can come back during the day tomorrow or whatever works for you Doctor Storm. Thank you again so much, for even seeing me." She smiles at Johnny, "Sorry it wasn't under better circumstances." "Oh, it's fine, you wouldn't believe how I ran … wait, maybe you would," Johnny says. He starts in on the story as he clears away the empty Fanta can, "So, when I ran into Bobby the first time in five years? Some genius was driving a four-story motorized wheel tank that he called "BIG WHEEL" down fiftieth, and trying to rob a bank. Bobby and I and Spider-Man were all somehow trying to stop the jerk. Spidey got run over, and Bobby and I kept accidentally countering each other, it was … pretty bad until we figured out how to work together. And somehow Spidey didn't squish, which … Well. I woulda squished." The Storm Front Racing approach: 50 percent baffle, 100 percent speed up unexpectedly. Also, the mental image of Spider-Man with tread-marks all down the front. "Please, just Sue," Sue shakes her head quickly, offering a small, reassuring smile. "I have a feeling we're going to be spending a lot of time together, Gwen. We might as well be comfortable." As Johnny goes into storytelling mode, she goes back to her chair, picking up the leftover stir fry to take a few more bites as she mulls it all over. "Come when it works for you, Gwen. I'll be at the lab pretty much all day, and if I'm not, then someone can give me a call and I can come over." If only any of them knew who Spidey was, it would have made the story all that much crazier; for now though, Peter Parker's identity was safe. Gwen smiled back at Sue as she listened to Johnny's story, "As amazing as that sounds, I really hope to avoid being squished or run over or anything like that. I'm good at science and music, being a superpowered hero or whatever? I think that's better suited to people like you and Bobby. It suits you both." She stands up from the couch and grabs her bag, removing all of the research she's done so far and hands it to Sue, "Here's what I've looked into so far. Maybe you can figure it out. I'll cya tomorrow Sue! Maybe you too Johnny, it was good to catch up even if for a little." With that, Gwen is gone, likely to make webs.